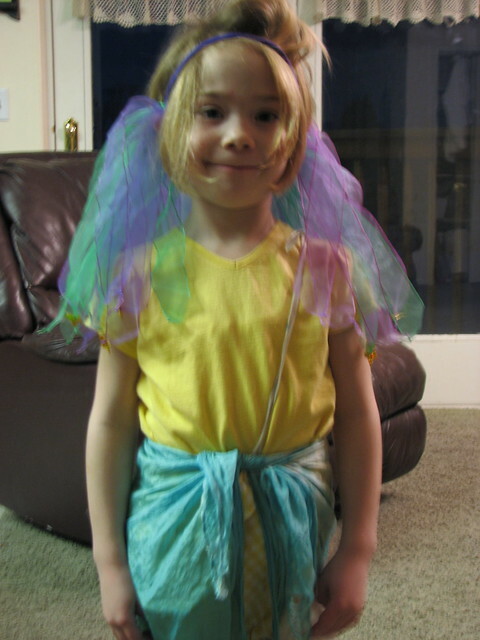 Last week was Purim, which is a Jewish Festival celebrating the story of Esther. Ever since we first read All-Of-A-Kind Family about ten years ago we have wanted to celebrate Purim. But, we have never done it. I have never felt like we had anyone else to do it with, which, now that we have done it, I realize is not important, but it sure seemed important at the time. It seemed like we needed others to know what we are doing and it to be a community event just like it is in All-Of-A-Kind Family. But it doesn’t need to be. We brought Purim gifts to four neighbor families and only one of them had any idea what we were doing. They all loved it and it was a wonderful opportunity for us to explain our love for Jewish stuff. 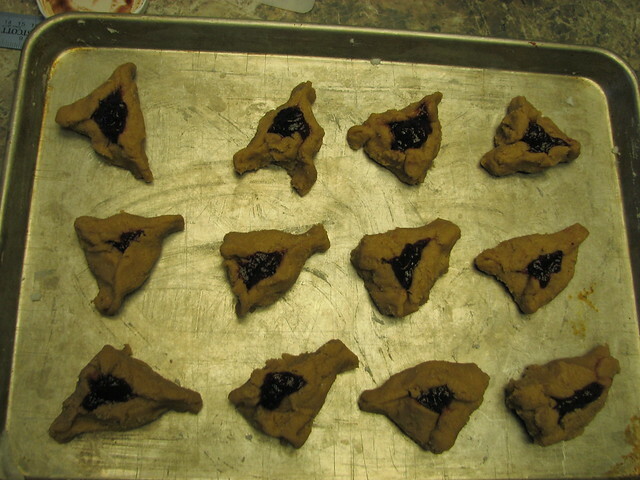 We made Hamantaschen cookies. I handed Keziah the recipe during afternoon project time and she made the dough all by herself. I have no idea if she did it right or not, but one of our recipients loved them enough to ask for the recipe so they must have turned out somewhat okay. Unfortunately I didn’t even get to try one! After the dough had chilled for several hours we started rolling it out and cutting out the circles. Annes and Fisher were pretty much experts at this task. 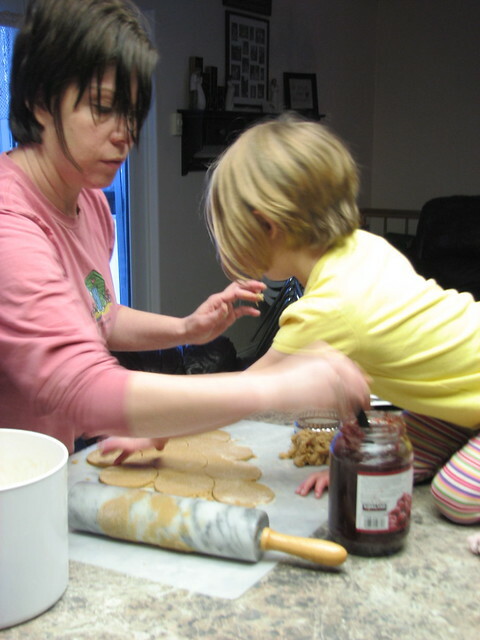 Then fruit preserves into the center, fold up the circles into triangles, transfer cookies to a greased cookie sheet and bake. If you are wondering if I felt like death warmed over, yes, I was in a lot of pain that day…and it shows in this pic. The cookies I folded up ended up looking a bit lot homeless, but Blythe’s were beautiful. I don’t know how that girl does it, but she creates beauty wherever she goes. Look at mine. Look at hers. Pretty amazing, eh? She is such an artist. Part of Purim is dressing up and Annesley was all over that idea. How do you like her outfit? 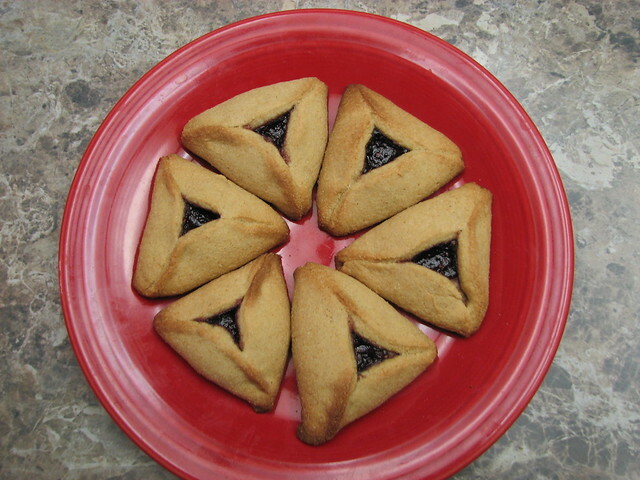 There are four mitzvahs to observing Purim. This year we did all four (except the first one – we only listened to the entire Book of Esther once) and are super proud of ourselves. 1. Hear the Megillah! Listen or read the entire Book of Esther two times, once at night and once in the day. You must hear or read every single word and make noise whenever Haman’s name is said. 2. Give Gifts of Food! Purim is a day we show extra special friendship to our friends. Send your friends gifts of food that include at least two different types of food ready-to-eat foods. For example: fruits and candies; cookies and a bottle of juice; etc. 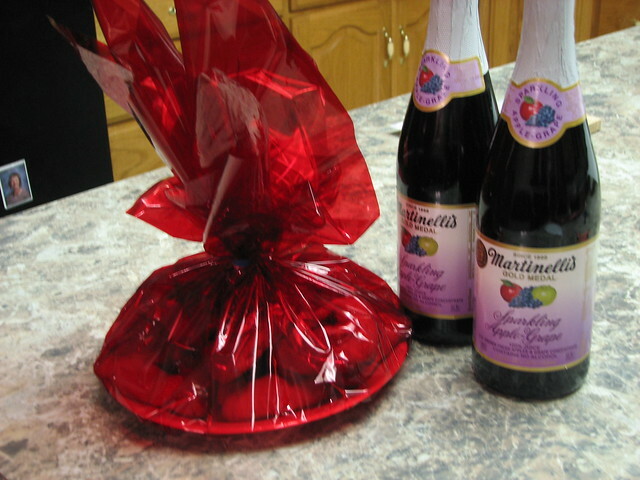 We gave Hamantashen and Sparkling Cider. 3. Give Tzedakah (Charity)! Give some money to two poor people (or more), or put at least two coins in your favorite charity box. We rolled up dollar bills and took them to two different families. I don’t think our Tzedakah did much for their bottom lines, but it was fun to surprise them with a little gift. 4. Eat and Rejoice! 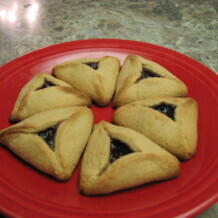 Participate in a festive meal on Purim afternoon. Sit together with your family and friends, sing Jewish songs, tell the story of Purim, and be merry! Our meal wasn’t as merry as it could have been and we didn’t invite friends over, but we still had a good time making noise makers, listening to the ten chapters of the Book of Esther, and drinking our Sparkling Cider. Even though I was hurting a lot that night, I am so glad we celebrated our first Purim. We were also Purimed (surely that must be a word?) by one of my Sheva & Shalom students. Thanks Sheri! It was super fun! Fruit preserves. You can also use Nutella. Mix butter and sugar. Cream well. Add remaining ingredients and mix well. Divide the dough into three sections and chill several hours or overnight. Roll out to 1/8 inch thick and cut with a 3-inch round cookie cutter or drinking glass. Place a teaspoon of filling each circle and fold over the edges to create a triangle shape. Place on a greased cookie sheet and bake for about 15 minutes (until golden) at 350 degrees. You can brush the cookies with egg before baking, if desired. They will come out browner if you do. What did I learn from Purim? Festivals, special days, or celebrations of any kind are so fun for my little children and I need remember that it is worth the work it takes to create this magic in their lives. Esther walked forward with faith without knowing the end result. She had no promise of safety or success in her endeavor. So it is often with us and especially with me and my hip…remember Esther! Inviting friends into our traditions is met with gratitude. Esther learned the culture of the kingdom and used those customs to find favor with the King. She did not force her ways onto the palace. Esther fasted and invited others to join her. I need to remember the power of fasting to strengthen my spirit and my reliance on my Savior. Hey Tam! I will be cleaning for Passover on Thursday and should be able to call then. I miss you so stinkin’ much! Richard’s birthday was today! I know! Give him a big birthday hug from me!! Your Thursday should be terrific timing! Talk to you then.